Written in Ochre: Day 20: What do I collect? When my sisters and I were young, my parents requested that we each elect an animal that we would like to have as the basis for any gifts we might be given. My younger sisters must have been much more exotically minded than me—they chose elephants and monkeys… I chose dogs. 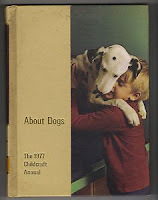 These collections began as stuffed toys but as I grew older, I was given dog motif paperweights; calendars; and charms for my most prized piece of jewellery, my charm bracelet. In the dining room (I think because it was the only place it would fit) was our bookcase and one whole shelf was graced by our Childcraft Encyclopaedias, which I believe represented our mother’s one foray into swooning to the smooth talk of a door-to-door salesman. 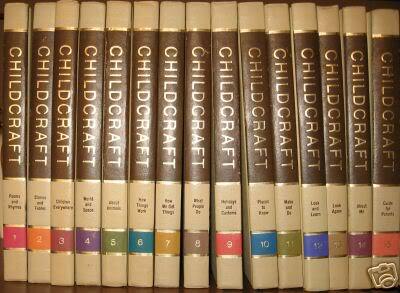 We had the complete set and even continued to purchase the Childcraft Annuals, one of which was About Dogs. I spent hours poring over the information about dog care and training as well as trying to memorise all of the different dog breeds. I would ponder over the breeds I had never seen before and try to decide which dog I would have when I was old enough to have one of my own. Our family had a Corgi at the time and I imagined having a dog big enough to hug me the way the Dalmatian on the cover seemed to be hugging the boy. It seems I really did grow up to collect dogs. I recently mentioned to a friend that, aside from a few months when I lived in a share house & the resident dog (and its owner) moved out, I had always lived with dogs. We now have three. And I didn’t end up choosing a breed, our dogs are all RSPCA mutts. Of course, the other thing I collect and potentially have too many of, is books. Unlike the family home where I grew up, we have three bookcases in the study; two in the lounge room; and I have plans for some extensive shelving in the bedroom and the spare room. I also wouldn’t mind some shelves in the kitchen specifically for cookbooks but with every wall either containing a door, a window or being curved, I’m not sure where I might put that one.